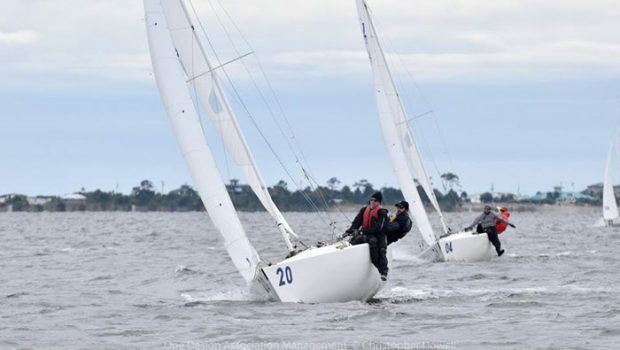 Fort Walton Beach, FL (March 16, 2019) – A shifty weather pattern following a cold front challenged the 30 J/22s on the middle day of the J/22 Midwinter Championship, but Mike Marshall’s Bad News (above) flourished in the conditions, posting a 4,1,1 on the day for 9 net points in six races. 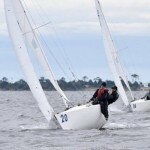 Discarding a 5 from race two, the 2016 J/22 World Champion not only broke the day one tie for first place, but has secured a 14-point advantage over his closest follower—Jeff Todd’s Hot Toddy. Places two through five are all within five points of each other, heading into the final day of competition tomorrow. Following Todd is Mark Foster’s Pressure Drop, whose solid day shot him into third place. Then, just one notch behind him are Casey Lambert’s Blackburn Marine Racing and Chris Doyle’s The Jug 4 1. In winds between 10-15 knots Saturday, Karen Glass’ Payaso opened triumphantly, with Foster and Doug Weakly’s HNL next. Marshall then earned his second of three bullets in the Championship thus far, in advance of Chris Doyle and David Muller’s Call The Ball. Closing out the day’s final top three were Marshall, Vincent Ruder and Todd. Racing continues through Sunday, March 17.